This weekend is a big weekend for us, we are celebrating our first full year in the new house. Our HOME has been a joy for us, giving us freedoms we didn’t have as a family for many years. John and I have been married for 27 years and have never celebrated living in our homes before. You may ask why now? Well, it took a year for us to get here and it has given me a new lease on life that I haven’t had in five or more years. It has made me a better wife, puppy momma and happier than I have been in years. It has also given me a sense of calm. I missed all the small things in life that are mundane for some but my joy in life. It has given John joy and peace of mind for me being safe while he is in NYC doing his job. It has also given him an extra half-hour of his life back every night, which is HUGE for him. John is a man who never complains about much but the commute was getting to him. Driving home from the bus station night after night took time away from him being able to have some quieter evenings. He loves coming home each night to me, Peanut and Reeses. We feel blessed because we not only love one another but like ach other too, well most of the time, LOL. We have enjoyed him coming home to no worries about what may have transpired during the day with me and my struggles. Do I still have bad days, the answer, YES. The difference is they are more manageable for me and the worries of getting a very large home clean are no longer on my mind 24/7, its attainable! 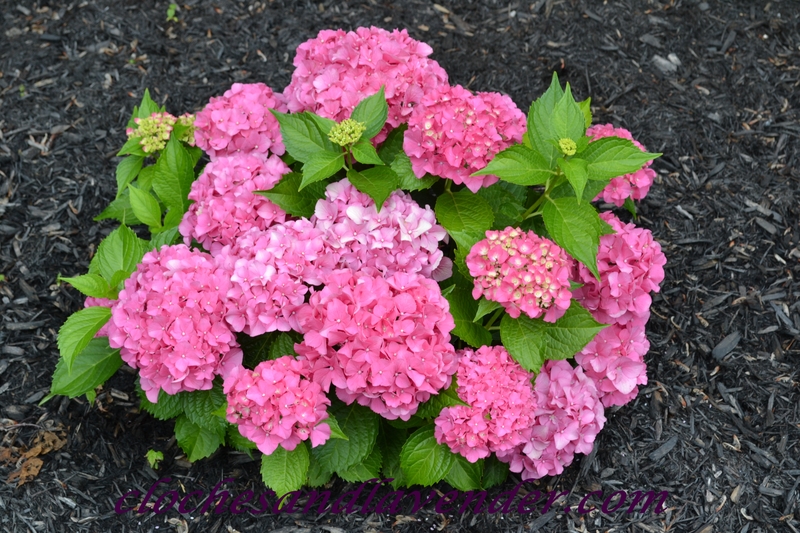 The photos in this post are of our beautiful Hydrangea. They are Everlasting in Garnet and as you can see they are doing extremely well. The surprise for us was, they are Garnet and go from bright pink to a faded green. Surprise YES, neither one of us had our reading glasses that day and it was extremely windy at the garden center so we only noticed the light green with pink edges on the tickets and grabbed them, LOL. For John and I, TYPICAL. Have a super rest of the week and we will be enjoying our LOVELY HOME for the weekend and years to come. Hi Cindy. Congrats on the first year in your new home. It is beautiful and you are truly blessed. A shorter compute is always a daily gift. Your garden is doing so good and the hydrangeas are gorgeous. Mine are huge plants but no blooms yet. Too much rain here maybe? Anyway, I wish for you and John to have many more wonderful years in your home filled with lots of happiness and always love and good health. Best wishes always my friend. Thanks so much my sweet friend. We do feel blessed and I’m blessed to have a dear friend in you. Your flowers are just gorgeous! I’m so pleased for you both!! and lucky you with your hydrangeas, mine shriveled up and almost died on me. Fingers crossed it survives this drought year! Too bad about the drought. We have been there years past. Have a great weekend! Congrats to you both Cindy…I’m so happy your enjoying your new home! Your front garden looks so pretty! I’m happy with the planting. I hope you have a fantastic weekend! It has been so fun to follow your house journey this last year. Your joy has shown through every post. Thanks Carol. Have a great weekend!! 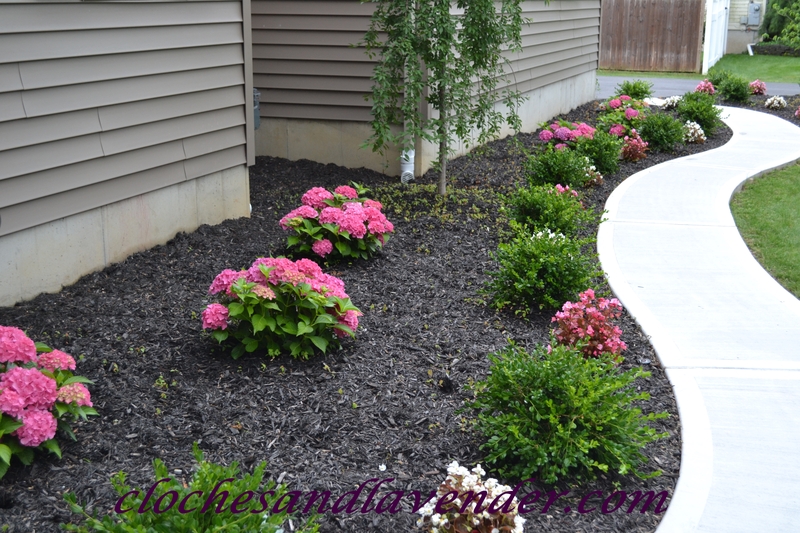 Congrats Cindy…and glad your hubby’s commute is so much better…love the hydrangeas!!! Thanks Shirley have a fantastic weekend!! Congrats on one year in the new house. So happy for you Cindy. Glad John does not have the heavy commute anymore. Your hydrangeas are gorgeous. Thanks Kris and have a great weekend! I’m so glad that you’ve settled in to your new life so easily. Transitions like this are hard at any time, but with your added struggles it could have been overwhelming. Love the hydrangeas. I have some pink ones but they never bloom for me – the buds freeze off in the winter despite all my efforts to protect them. Thanks Heather. The one problem we have now is when to prune. I have looked on every site and they talk about old wood and new wood. That’s great but for people who have never planted these that doesn’t help much. We need specifics; I’ve sent emails with no responses coming in so that is annoying me to no end. It’s heartwarming to hear you’re so happy in your new home Cynthia. You deserve every last bit of it, and so does your hubby. 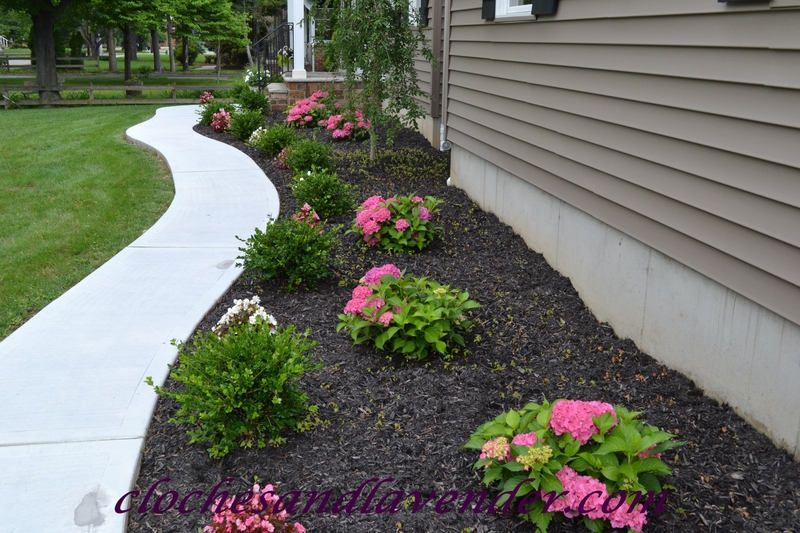 Your gardens are coming along beautifully and it’s clear that whatever kind of soil you have the hydrangeas love it. Happy Anniversary to you both, and many, many more joyful years together. you so much Doreen and I received your other note and it warmed my heart. Thanks for the encouragement. Congratulations on the first year in your beautiful home!!! I’m so glad you husband was able to shorten his commute and be able to spend more time with all of you. Your hydrangeas are so pretty! Thanks so Des. It’s been the best and we love the hydrangea too. Have a super weekend! Congratulations, Cindy! I can’t believe it’s been a year already! It sounds like this move/house was the best thing for both of you. I’m sure there is less stress for both of you, too. Your hydrangeas look gorgeous! That whole bed is going to be stunning when they grow bigger, too. Have you cut any blooms yet? 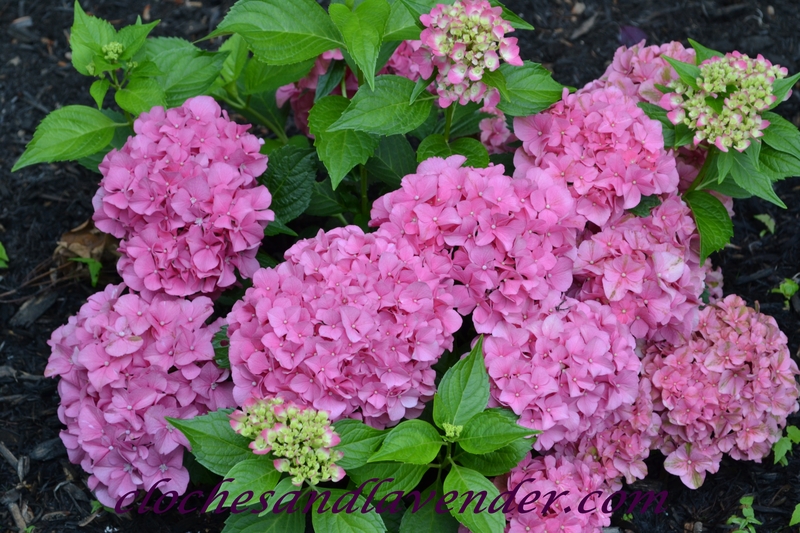 I also have pink hydrangeas, but I haven’t cut the blooms yet. 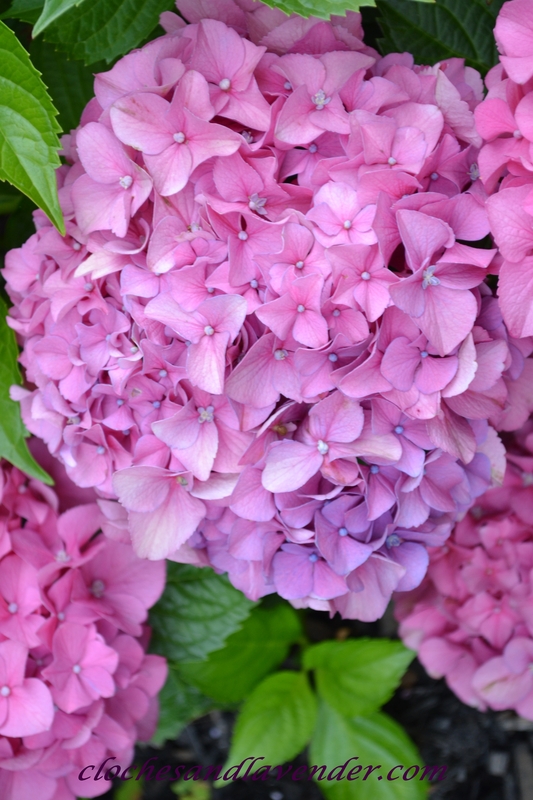 Your hydrangeas are beautiful! I just planted my first one this year. So, far, they are looking good! Found you on Make it Pretty Monday link up party. Thanks so much for the visit and I hope you follow Cloches and Lavender back! Congratulations on your new home and its one year anniversary! I think it’s wonderful to celebrate life’s little even as well as the bigger ones. Your hydrangeas are beautiful. 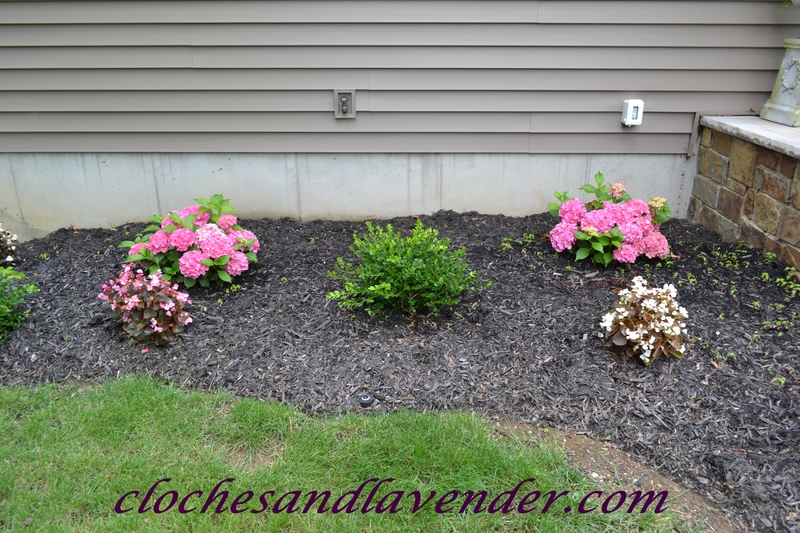 Congrats on your 1st year of your new home…your hydrangeas are just beautiful! Thank you for sharing at Share it One More Time! The hydrangeas are little beauties! 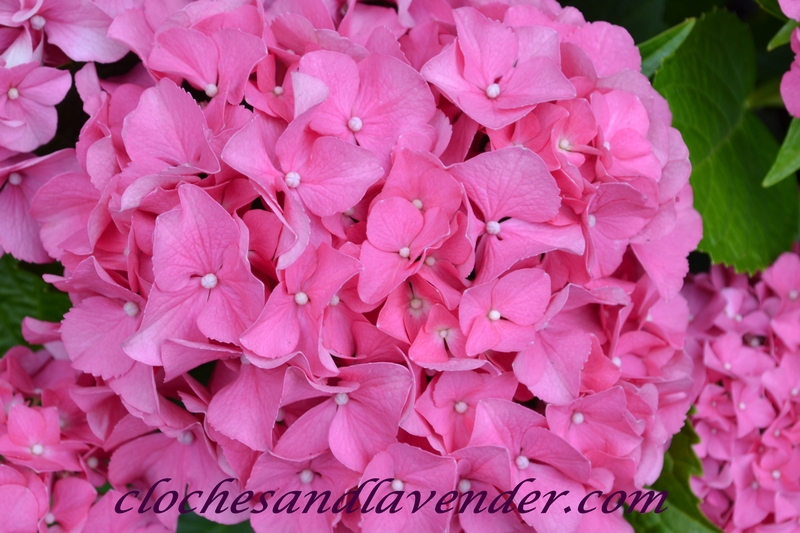 All the hydrangeas change through the growing season as they develop and age. It’s a joy to see them at their peak! Congratulations on your one year anniversary and it sounds like you’ve made a great decision moving there! Liz thanks so much. I always enjoy your blog and I have wanted to you to stop by, so thank you very much. I hope you will follow along. Oh what beautiful hydrangeas. Over the years they will grow into large bushes of beautiful blooms. Happy first anniversary in your new home! Just found your blog via A Delightsome Life and have really enjoyed looking around your site! 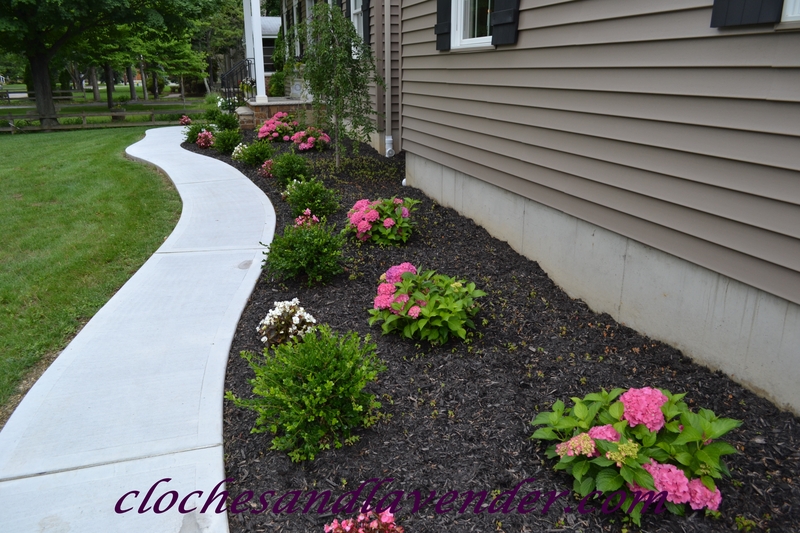 I also blog from northern NJ and love hydrangeas and lavender (I also have a family member with MS, so I can appreciate the challenges you face). Thanks so much for sharing the beautiful photos and congratulations on the anniversary in your new home! Wishing you many more years of happiness in your cozy home. BTW – love your home! Thanks so much Kathryn. Thanks for hosting. So sorry I haven’t thanked you for these. I haven’t been feeling great with my MS and have been taking a bit of a break. I’ll Be back to posting soon.